Located 1,700km north of Brisbane, Cairns is a popular holiday destination and the gateway to Tropical Far North Queensland. As the below Cairns map shows, the city is situated on a stunning coastline overlooking the Coral Sea and is famous for its Esplanade, Lagoon and the nearby Skyrail Cairns. 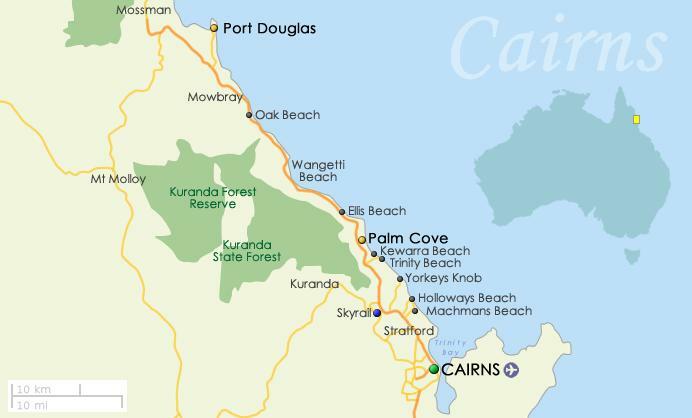 This Cairns map shows a portion of the Captain Cook Highway, the major motorway that runs along the coast and connects to Port Douglas in the north as well as the Bruce Highway in the south, the direct route from Queensland’s capital Brisbane to Cairns. Although flights are available from Brisbane, visitors who have the time are recommended to enjoy the scenic drive up the coast over a couple of days. Renowned for its fantastic tropical weather, Cairns is perfect to visit year round and attracts thousands of tourists throughout the year. To cater to the influx of visitors to this popular holiday destination, there are a great range of accommodation options which are highlighted on the Cairns map below. You can use this Cairns map to help plan your time in town including helping you to decide where to stay. Giving you a reference point for where things are located, the map can help you to choose what you would like to be located near including the Cairns Esplanade, Cairns Lagoon and Cairns Casino to name a few popular attractions. Use the markers on the Cairns map to pick a property and see its star rating, name and a brief overview of its accommodation and facilities.